For thousand of years, flocks of sheep have roamed the Roman 'Campagna', supplying the milk from which we make Pecorino, one of the few cheese in the world with such an ancient origin and history. The milk produced by flocks of sheep in a natural enviroment rich in grass is gathered between october and june and taken to our factory where it is filtered and processed to make one of the oldest cheeses in the world. The rind is smooth and thin and ivory-coloured. The consistency is medium hard, compact with small holes. The taste is sharp and strong. Caciotta Romana is a typical cheese made from pastourized sheeps milk and lamb rennet, seasoned for a period of 30 days to 6 months. Caciotta has a taste made more piquant and distincive by the seasoning and refining process, giving it a quality of its own. 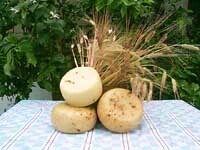 In form they have the typical shape of Caciotta but there are also cylindrical versions. The rind is pale yellow. The consistency is soft, dense and with small holes. The smell is of milk and yoghurt, but this changes with the season. In the mouth the consistency is soft, dense and slightly granulous. The taste is sweet, the after-taste slightly bitter. Ricotta was known even by the Greeks and the Romans. Columella, in his 'De Re Rustica describes various technological phases. 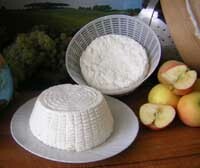 Ricotta is produced exclusively from the serum of sheep's milk our own Ricotta boasts a particularly hight quality. Unlike with other cheese productions, the production of Ricotta does not involve the curds coagulating because it uses as a raw material not milk but serum. To the eye the dominant colour is white. To the touch is creamy. It has the classical animal odour that comes from sheep's milk. Soldo di cacio is produced with pastourized sheep's milk, from october till april. Paste is soft, young and sweet. To the eye it has the shape of a small 'Caciotta'. The rind is smooth and straw-coloured. To the touch the paste is soft and elastic. 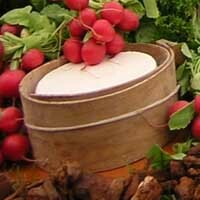 Being a quite fresh cheese, it is very easy to cut. It has a white surface with small holes. It has a milk, yogurth and yeast like smell. It has a sheep's smell as well. In the mouth the paste gives away flavours of the original milk. It has a sweet taste with a persistent after-taste. During the autumn and winter the taste is stronger with a more persistent sheep like after-taste. Canestrato is a cheese with a medium hard paste. It comes from pastourized sheep milk and lamb rennet. It matures in climatized rooms from 90 to 180 days. To the eye the rind is wrinkled and the shape has the signs of the original mould (canestro). It has a yellow colour and to the touch the structure varies according to the seasoning: soft when fresh, granulous and friable when more mature. To the cut the paste is ivory-coloured. It has a compact surface with some small holes. The range of smells is quite wide: milk, yoguth, yeast and butter smells when fresh; straw and herb smells when more mature. In the mouth the taste goes from sweet to slightly hot. Pecorino in Grotta has a long seasoning in natural caves. Its production process is the same as the traditional Pecorino's one, the comes from the first and the second milking. The milk is processed after 12 hours and curdled with lamb rennet. The paste is heated for 10-15 minutes at a temperature up to 43�C. Then it is manually dry salted for 5-8 days. The cave seasoning may take from 8 to 18 months. During seasoning the cheeses are turned over and cleaned manually. The special nature of Pecorino in Grotta is due to the seasoning caves, which keep the quality of the raw material. To the eye it has a cylindric shape, with a wrinkled rind and a deep yellow colour. To the touch it is friable with almost transparent drops of grease. To the cut it is hard but softer in the centre, granulous and friable. To the nose it has smells of straw, dry fruits, toasted nuts, liquorice. In the mouth the taste is strong, persistent, spicy and slightly hot. It has the same production technique of Caciotta Romana. Spices are added during the breakdown of the curdling process. We produce various spicy cheeses: chilli, pepper, walnuts, pistachio for cheeses with a 30-120 days seasoning process. Fresher cheeses are produced with rocket, truffle and olives. To the eye it has a caciotta shape with grains of spices in the surface. To the touch it is soft and elastic. To the cut the paste appears coloured and dotted from the spices. Spices reveal themselves to the nose during the cut. In the mouth the tastes will be the ones coming from the added spices. The pastourized sheep's milk is heated at a temperature of 37�C, and coagulated with lamb rennet. 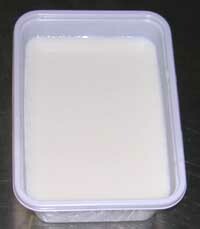 After the coagulation, the curd is extracted and inserted in small basins left to cool at room temperature for approximately 1 hour, then it is sealed and transferred into the refrigerator at a temperature of approximately 8�C. Because of the freshness it must be consumed within 24-48 hours. Advisable to taste it as soon as produced in order to fully appreciate the freshness. Optimal if bound together with honey or sprayed with cinnamon. To the eye the color is white. To the touch the paste is soft and creamy. To the cut it is soft and without resistance. To the nose it has the odour of the sheep. In the mouth the taste is sweet and it has the typical taste of sheep. The pasteurized milk is heated at a temperature of approximately 36�-38�C. The coagulation takes 30 minutes. Later, the curd is broken off, in order to obtain large grains, and it is inserted in the stamps. It is processed in order to obtain the clearing of the serum, and finally salted by hand. The taste of the cheese changes in relation to the type of pasture (autumn, winter or spring). To be consumed within 1-15 days. To the eye it has a cylindrical shape, the rind is white, and barely pointed out. To the touch the paste is much elastic , shiny and slippery. To the cut the surface of the compact paste has small holes. To the nose, being a fresh cheese, milk yogurt and yeasts prevail. Perceptible the characteristic odour of sheep. In the mouth the taste is sweetish. The consistency is rather elastic and the after-taste is slightly bitter with a taste of sheep.